A joint meeting of the AFINET project arable and livestock UK agroforestry groups will take place on Monday 16th July 2018 at David Rose's farm, The EcoCentre, Screveton, Nottinghamshire. 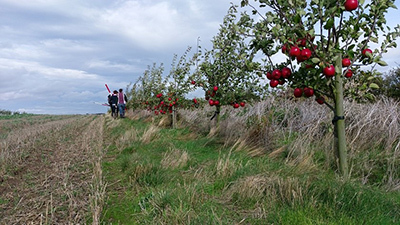 This practical workshop will focus on agroforestry design, bring along a map or aerial photo of your farm/ field to discuss your agroforestry plans with the group. David has both a silvoarable system with apples and cereal, as well as a newly established edible woodland which he plans to graze. See here for more information about David's farm and agroforestry.